Happy Xboxmas! For our holiday special we are joined by our pal Curtis as he gives us a tour of some favorite video games. First we get to channel our inner holiday rage and blow stuff up with Call of Duty: Black Ops . Then we get in touch with our inner ten-year-old while exploring Peggle . Curtis springs a mystery game on us. Mike & Brian attempt to play a virtual version of Jenga. We end our Xboxing with a visit to the strange and beautiful world of Beautiful Katamari . But that’s not all! We also announce the winner of our first contest. 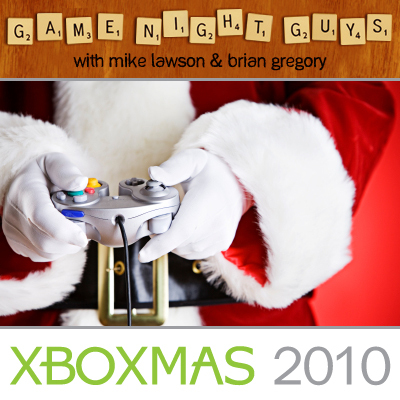 Plus we listen to holiday greetings from some of our podcasting friends. A huge thanks to Curtis for being our special guest host. If you’d like to play games with him, his Xbox Gamertag is curtishill74. We also want to thank Madge & Dave from Unload with Madge & Dave, Sara from How Much Do We Love… and Michael Fox from The Little Metal Dog Show for being a part of our Xboxmas festivities. If you haven’t checked out their podcasts, do so now! They are all terrific and awesome. Merry Christmas! Spread some holiday cheer! But I think perhaps, one of my favorites. You say “longest” like it’s a bad thing! Fun podcast as always guys! What were the songs you used this time around? The 8-bit-y rock song was nifty! Thanks Trachalio! We had fun doing it. That’s a little piece of stock music we found. We thought it fit well into the theme.